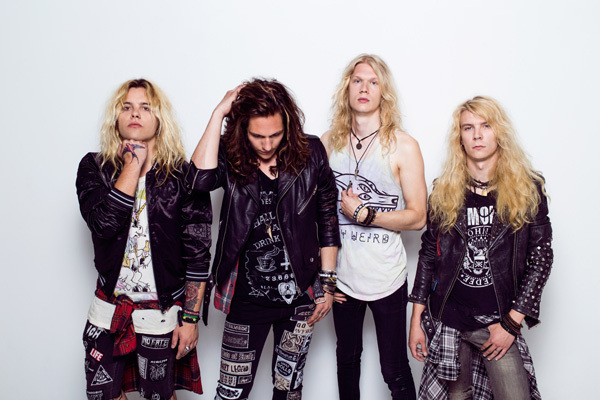 Stealing a page from 1987, and bands like Guns N Roses and Skid Row, is Finnish wunderkinds Santa Cruz. With their self-titled sophomore effort, the foursome revisits the heyday of big hair, sleaze-infused, melodic hard rock and metal. And they do it with skill and creativity. From the start, and photograph at right, you can see these youngsters have the look for the genre. Also, listening to their tunes Santa Cruz has the attitude, the punk snottyness, swagger, and lyrics punched with vulgarities, that makes for sleaze potential. But while these are important and largely necessary, if you don't get the sound right, you're likely to become a boring poser. Luckily, on the strength of skillful musicianship and competent songwriting, the boys have the sleaze metal gig wrapped up in a denim and spandex box. Their approach, however, seems heavier than some of yesteryear's material, but not by much. 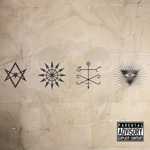 In one sense, the heaviness reminds of an attempt to invite some modern hard rock and metal harshness into their music. Yet, because Cruz recognizes melody and harmony can't be tampered with, the heaviness is equally tempered. The iron hand in the velvet glove as it were. After this, two elements stand out. First, there's some terrific guitar work here from twin players. They boast some good guitar harmony from an abundance of melodic riffs. These, in turn, give way to large and fiery leads. But, again, this is essential to the genre. Be glad they get it. Second, once more important to the genre mix, Santa Cruz puts proper emphasis on vocal arrangements. From the harmony within the ballads Bye Bye Babylon or Can You Feel The Rain to the gang vocals of 6(66) Feet Under, they get it and it sounds good. All these things are complimented by catchy hooks and phrasing in both arrangement and lyrics, the wrapped up in true rock groove. It's the total, and correct, package for melodic sleaze heavy metal. Favorite cuts: the aforementioned 6(66) Feet Under, with Wasted & Wounded, Vagabonds, My Remedy, and We Are The Ones To Fall, which was featured in an ESPN video. Recommended. Finnish wunderkinds Santa Cruz basically nail down the classic melodic sleaze metal genre, putting it in a modern context, thanks to some skillful musicianship and tight songwriting.